The Legacy Land Conservation Commission is a nine-member State commission created by Act 254, SLH 2006, to advise the Board of Land and Natural Resources on projects proposed for funding under HRS, Chapter 173A (Acquisition of Resource Value Lands). Guided by the statutory priorities of HRS, Section 173A-2.6, the Commission conducts a grant application process, public review of applications, and decision making with staff support from the Legacy Land Conservation Program, Division of Forestry and Wildlife. The Commission has two vacancies right now, with one more vacancy that opens on July 1, 2019. (3) a person possessing scientific qualifications as evidenced by an academic degree in wildlife or marine biology, botany, forestry, ecology, resource management, biogeography, zoology, or geology. Now is the time to apply with the Governor’s office to serve on the Legacy Land Conservation Commission. 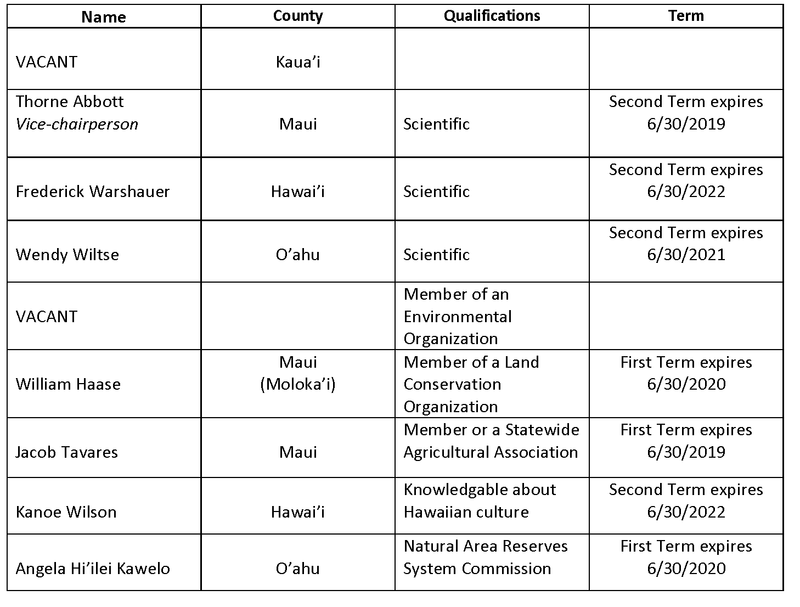 Please visit the State Boards and Commissions website at http://boards.hawaii.gov, or call the Legacy Land Conservation Program office for more information at 808.586.0921.